Ask Republican strategists about viable female House recruits for next year, and the first name that consistently comes up is South Dakota Secretary of State Shantel Krebs. As the front-runner for the GOP nomination in the at-large seat, her candidacy gives the party a rare opportunity to replace a retiring female Republican with another woman. But of the nine GOP women running in open seats whom strategists mentioned most often, most face more competitive or crowded primaries. State House Majority Whip Carol Miller is one of several Republicans running for West Virginia’s open 3rd District seat. State Rep. Yvette Herrell is running in New Mexico’s open 2nd District. Former state Assemblywoman Victoria Seaman — the first Latina Republican elected to the Assembly — is running for Nevada’s 3rd District. Several women are running for Ros-Lehtinen’s seat in Florida’s 27th District, including former Miami-Dade County School board member Raquel Regalado. Michigan businesswoman Lena Epstein dropped down from the Senate race to run for the open 11th District. In another seat opened up by a departing male Republican, Ohio state Rep. Christina Hagan is vying for the nomination in the 16th District. Elsewhere in Ohio, Delaware County prosecutor Carol O’Brien plans to run for the 12th District seat that Rep. Pat Tiberi plans to leave by early next year. GOP women are running as challengers too. Farmer and small business attorney Tiffany Shedd recently entered the Toss-up race in Arizona’s 1st District. Trump surrogate and soap opera star Kimberlin Brown is running in a more challenging seat, hoping to take on Democratic Rep. Raul Ruiz in California’s 36th District. Some of these women are more credible candidates than others. But it’s still early. Julie Conway, executive director of VIEW PAC, which is dedicated to electing GOP women, expects even more female candidates to announce in the coming weeks in open and competitive seats. “There is a really talented crop of women candidates this cycle, and I believe we will be adding many to the GOP conferences in the next Congress,” GOP strategist Liesl Hickey said. VIEW PAC is starting an independent expenditure arm this year to help get female recruits through primaries. Women2Women, an offshoot of the Republican Main Street Partnership, is debuting a PAC to help fund female candidates from the “governing wing” of the party. Sarah Chamberlain, Main Street’s president, has spoken with EMILY’s List about how to effectively fundraise to help women candidates. GOP donor Paul Singer is expected to launch a new effort later this fall to help elect GOP women — an evolution of a similar 2014 effort. 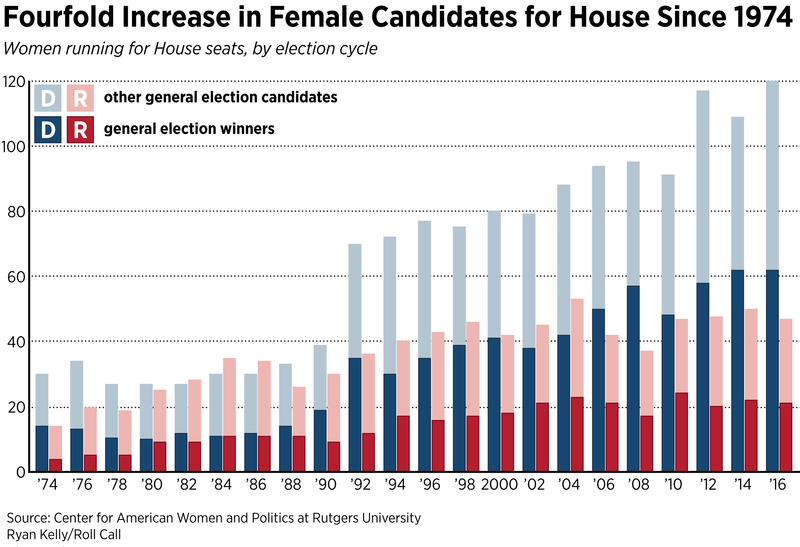 Female Republicans make up the same percentage of the Senate as they do the House. But the GOP has the possibility of making net gains in that chamber, now that Maine Sen. Susan Collins is sticking around. Besides Blackburn in Tennessee, state Sen. Leah Vukmir is running for Senate in Wisconsin. Both women will face primaries. Most of the women leaving the House are pursuing higher office. “Diane Black is running for governor. That’s how you get a woman in the White House. Noem too,” said Missy Shorey, executive director of Maggie’s List, a PAC that helps elect conservative women to federal office. But GOP strategists would like to see more women running for the House. “What’s sad is that we’re talking about a handful,” said Chamberlain, who focuses only on female candidates who align with her group’s values. “We should say, ‘Oh yeah, there’s 20 of them.’ And we’re like, ‘Oh yeah, there’s one here, there’s one there,’” she added. At the beginning of this year, VIEW PAC’s Conway expected there’d be more GOP women running for office. President Donald Trump’s election proved candidates could run — and win — without previous political experience, and she thought more women would think they could do that too. That hasn’t yet proved to be the case on the Republican side. Conway estimates there’s about the same number of GOP women running at this point as in previous cycles. Democrats have been talking up the surge in female candidates wanting to run since Trump’s election. According to EMILY’s List, nearly 19,000 women have approached them about running for offices at all levels this year, compared to just over 900 women during the entire 2016 cycle. But if Trump hasn’t inspired more GOP women to run for office, his candidacy hasn’t necessarily discouraged them from running either, Chamberlain said. “We’ve had the same problem for years. It’s nothing to do with Donald Trump,” she said. Some of the reasons why women don’t run for office as frequently as men are practically cliches by now: They need to be asked. Fundraising is difficult, especially when men still write most of the checks. And they don’t want their lives (and their children’s) on display. The timing also has to be right. John H. Sununu, chief of staff to former President George H.W. Bush, tried to get Brown, the candidate in California’s 36th District, to run for Congress in the 1990s, but the actress had two young children. Now her kids are grown. “I’m at a position in my life right now where I’ll still be that mom, I’ll still run that home, I’ll still be that wife, but I’m able to do more,” Brown said. Shedd, the Arizona candidate who runs a 600-acre cotton and wheat farm with her husband, has been interested in politics and policy since interning for former Rep. Jim Kolbe. She said she never thought twice about running as a woman since she’s mostly worked in male-dominated industries. “The biggest complaint I have running for Congress is I have to wear uncomfortable shoes,” Shedd said, noting she hopes she can wear her farm footwear if she comes to Congress. “There’s nothing you can’t do as a woman wearing cowboy boots,” she said.